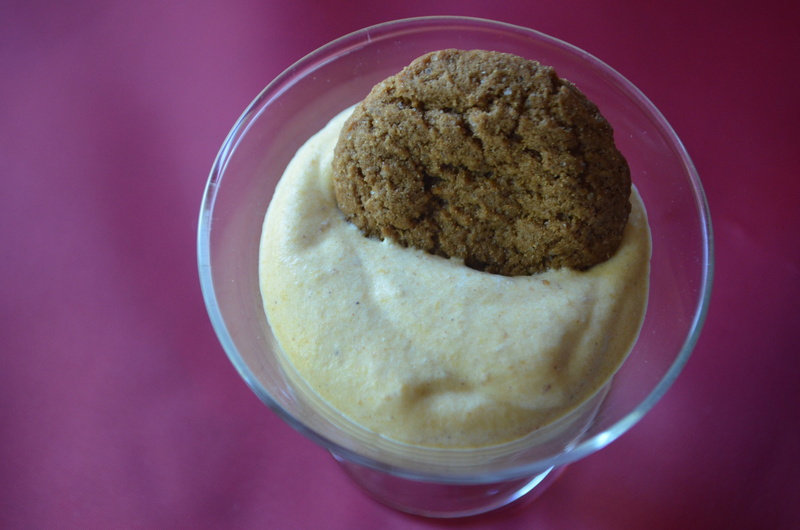 If you only try one new pumpkin recipe this fall, let it be my Five-Minute Pumpkin Mousse. Don’t let the word “mousse” intimidate you because this is as easy as it gets: it takes five minutes and has five ingredients. You simply whisk together sweetened condensed milk, canned pumpkin, pumpkin pie spice, and whipped topping. Then serve it with gingersnap cookies for dipping (although the velvety mousse is delicious on its own). I’ve created a variety of pumpkin mousse recipes over the years, but this is my best. I gave my 3-year-old – who is hesitant to try new things – a bite and asked if she wanted another bite. She said: “I want the whole thing,” and promptly took it from my hands. She licked the bowl clean. My husband said he could bathe in this; my mom said it was better than pumpkin pie. The rave reviews have ensued every time I make it (and I am sure you’ll get the same response). This recipe will be a winner this holiday season. It’s even better after a few hours of refrigeration, but can be served immediately, too. This mousse would be great at your Halloween party. Simply carve out a small pie pumpkin and fill it with mousse and serve it with Gingersnap cookies. Beat or stir together sweetened condensed milk, pumpkin, pumpkin pie spice and whipped topping, until combined. Pour mixture into 2-ounce glasses and top with a gingersnap cookie. Serve immediately. Other serving options: If you have a smaller crowd and want to serve larger portions, you can serve pumpkin mousse in wine glasses with or without a cookie. You can also crumble cookies and put them on top. This entry was posted in Desserts and tagged cool whip, delicious, dessert, easy, Entertaining, fast, gingersnaps, Halloween, holidays, mousse, Party, pumpkin, pumpkin pie, quick, simple, sweetened condensed milk on October 19, 2015 by Juliana Goodwin. The sauce is so delectable and rich, you will not miss the pasta. You will shed about 30 carbs per cup from this dish though. If you’ve never tried it, spaghetti squash is a big yellow squash that you bake and when it’s done, you use a fork to shred the flesh and it turns into strings that resemble noodles. It’s a healthier, lower-carb option than past; a cup of spaghetti squash has less than 10 carbs compared to about 40 carbs in pasta. My amazing red sauce was adapted from a recipe my dear friend Heather Landwer gave me a few years ago. I had my own red sauce recipe at the time, but it took about 5 hours to make and this one is just as good but takes about 1 hour and 10 minutes (most of that time is just simmering). It is an intense, thick red sauce and it pairs perfectly with spaghetti squash. I liked the combination so much, I will not use traditional pasta again with this dish. Cut spaghetti squash in half and remove the seeds and strings in the cavity. Drizzle with olive oil and sprinkle salt on the flesh. Pierce the flesh with a knife in several places. Place on a baking sheet and bake for 1 hour. While the squash cooks, chop a large white onion. In a pot or pan with a tight lid, fry the sausage and onion together. When sausage is nearly cooked, add oregano, basil and sugar. When it’s cooked through, drain the fat off the sausage and return the mixture to the pan. Add tomato paste, water, tomatoes, garlic, bay leaves and bring to a boil for 1 minute. Then reduce to a simmer, cover and simmer for 1 hour. When the squash is done, remove it from the oven and use a fork to shred the inside. Continue to shred until you have removed all the flesh away from the shell. Serve topped with red sauce. This entry was posted in Main Courses and tagged comfort food, delicious, dinner, easy, Italian, lighter, low carb, lower calories, pasta, quick, red sauce, sausage, spaghetti, spaghetti squash, winter squash on October 17, 2015 by Juliana Goodwin. Friday nights call for pizza. After a long week, a quick, satisfying pizza with a glass of wine is the perfect end to the week. And this pizza is fantastic. 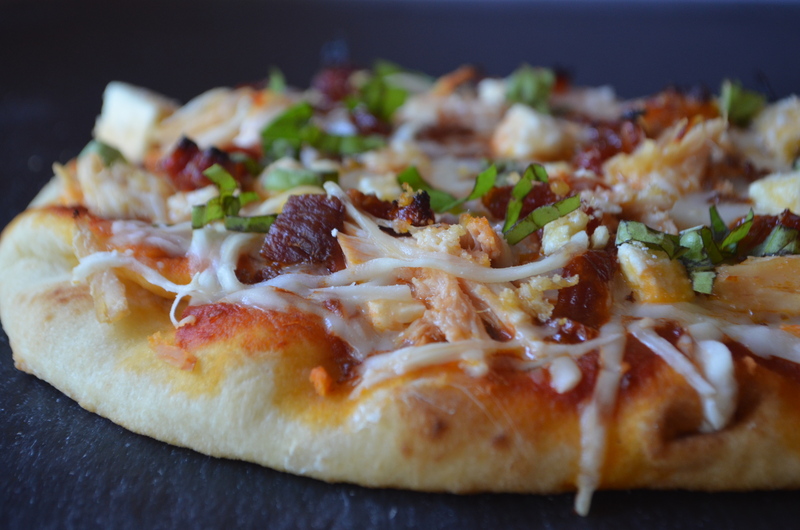 I use Naan, which is my favorite pizza dough, and then top it with tomato sauce, chicken, sundried tomatoes, cheese, bacon, and feta. After it bakes, I sprinkle basil on top. It’s quick, convenient and delicious. What more could you ask for as you end the work week? I hope you enjoy it. The sundried tomatoes and fresh basil really lift the flavor of this pizza; and of course, the bacon adds a lot, too. This pizza is easy, great for a quick dinner or a party. Spread pizza sauce over dough. Top with chicken, bacon, sundried tomatoes and cheeses. Bake for 15 to 18 minutes. Remove and garnish with slices of fresh basil. Allow to rest for 5 minutes before slicing. This entry was posted in Appetizers, Main Courses and tagged Appetizer, bacon, basil, chicken, delicious, easy, Entertaining, feta, friday, nann, pizza, quick, recipe, rotisserie chicken, sundried tomatoes on October 9, 2015 by Juliana Goodwin.